There seems to be a lot about Noah's Ark in the news lately. I began to notice more than a few stories popping up so I did a quick news search and was surprised at all that I found. 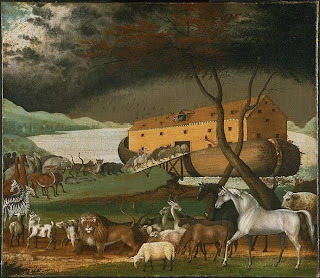 But before we began exploring these links, I wonder if I am the only one who finds it odd that people have transformed the story of Noah and the flood into a quaint children's story? We wallpaper the nursery with pictures of Noah's Ark, create toys with action figures and produce story books that feature cute pictures of animals. Heck, we even have birthday cakes made to look like the ark. But has anyone really thought about the story before doing all this? The story is about the destruction of the world. All but eight humans are wiped out along with a significant portion of the animal kingdom. Is this the kind of story that we want to hold up to children as something to celebrate? I know it is in the Bible, but so is a lot of other stuff. For instance, I don't see anyone making an Elijah action figure that can kill all the prophets of Baal. Or how about Joshua committing divinely inspired genocide? Somehow making the story of Noah into a children's bed time story and wallpaper design is like creating a Ford's Theater play set or a Titanic for the bathtub. But as I said, there is a lot of news about Noah's Ark and I think, as you will see, it proves my point. I hope you find these stories informative if not oddly interesting. First off, lets not forget that the Answers in Genesis people are building a life size Noah's Ark that will be part of a new theme park called Ark Encounters. I suspect that this will be a water park and wonder how successful it will be. After all, if this is going to be a 'biblical park' then all but eight of the admission paying guests will be wiped out each time the gates open. Of course, the folks in Kentucky will have to compete with the other life size Ark that is being built in Holland. Something tells me that the folks in Holland have a bit more experience with floods than those in Kentucky. Keeping the fun in the story of Noah's worldwide disaster is the online game developer Make Fun Inc. They are producing a game about Noah's Ark for Facebook. Tired of all those games on facebook that you can no longer block? Well here is another one. Players participate in such tasks as gathering wood (no mention if it is Gopher), pitch and clearing trees (doesn't sound environmentally friendly). You also need to farm and harvest food for the long journey ahead. And since there are ten levels your Christian facebook friends will be haunting you with this game for sometime. There is no indication of what happens when you complete all ten levels. Perhaps all of you friends on facebook get flooded? Not into games or amusement parks? How about a resort? A couple in Utah is building a Noah's Ark getaway retreat for families which features a rainbow room and a restaurant where you can dine at the captains table with Captain Noah. The restaurant is probably a good move since I suppose any meals based on Noah's Ark would have a good supply of meat. Of course, once the selection is offered twice it is off the menu for good. Of course not everyone has decided to cash-in on the story of Noah. Some take the story very seriously like Larry and Mary Graybill who spent $50,000 and 15 months building a copy of Noah's Ark a tenth of the size of the original. Their goal is to prove that the story of Noah is true. You can even watch a video of the Ark launching. You have probably heard about the Chinese and Turkish explorers who claim to have found Noah's ice encased Ark on the top of Mount Ararat. Well now there is a movie in which you can witness the treacherous journey made by these explorers. Think Survivor meets National Geographic. Donald Mackenzie who disappeared a year ago while looking for the Ark on Mount Ararat. One hopes that Miss D'Errico will be prepared for the frostbite weather of Ararat since it is certainly not the same as a California beach.